Parents nowadays would normally balk at cultivating their children’s learning habit by force. But being concerned parents who want something to be done to address their children’s lack of discipline and reading habit might nevertheless resort to more extreme measures. Designed particularly for caring mums and dads who have exhausted resources to get their kids to sit down quietly on their desk to finish their homework, Study Ball could be the ultimate way to achieve this. 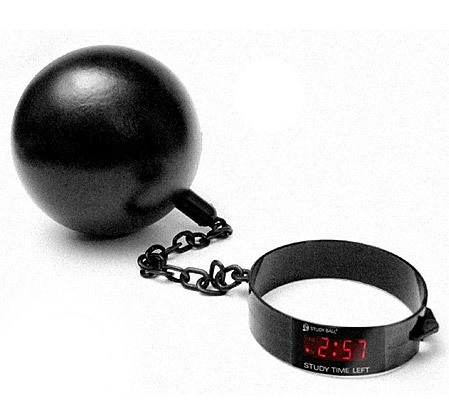 Weighing about 20 pounds or 9.5kg, the prison-style Study Ball is tied with a shackle with a 16.5-inch chain and there is a programmable study timer built-in to the shackle. Desperate parents can chain their kids to the Study Ball and set the duration for a study session. Kids will be unable to leave their desk until the study session is over. A small digital display will indicate the countdown time of the “Study Time Left”. Once the time is up, the electronic device will beep and the lock will automatically open. The shackled and imprisoned kids will thence be “freed”. In the event during the “prison” time, kids need to go to the toilet or have other urgent matters to attend to, parents can unlock the shackle with a safety key. Sounds rather brutal and primitive? Well, extreme measures may be needed for extreme situations. Costing a mere $115, the interesting Study Ball perhaps overturns all modern learning theories and beliefs about child psychology. However, some believe it could be a good device to teach children about responsibility, patience and discipline in a physically visual way. Just wonder what will be the reaction of the parents and adults, though, if bosses were to apply this device at the workplace.